What are we going to name "Baby D"??? 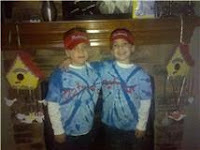 I love Gavin and Nolan, but Matt does not like either. You would think after 13 weeks of bed rest I would have had time to come up with a name! We will just have to wait to see him to decide. I go for a non-stress test tomorrow and plan on asking the nurse a lot of questions regarding the timing of my c-section. We are still not 100% sure it will be on Monday. There is still a chance my doctor my decide to deliver the baby on Friday! I have such mixed emotions about the delivery. On one hand I will be so glad to finally be done with bed rest and worrying. 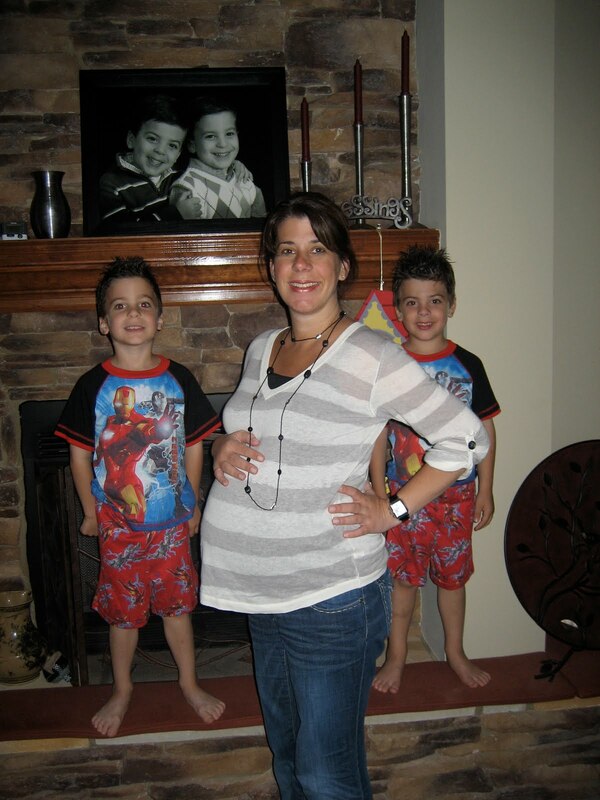 On another hand, I do not plan on being pregnant again, so I want to cherish every last moment. I am hoping to get some solid answers tomorrow, but I do not think there are any "solid" answers when it comes to Baby D! Thank you for all of your love, support and prayers. We are blessed with another week! I was discharged from the hospital on Wednesday. My doctor wants me to be "overly cautious and have a low threshold to call or come into the hospital for either contractions or god forbid a bleed. I spoke with my doctor today and he said if I make it to Friday, Sept 24th, I will have an amniocentesis to check for lung maturity. If the baby's lungs are developed I will have a C-section on the morning of Monday, September 27th. If in the meantime, I have stronger contractions or bleeding I will be admitted to the hospital and my deliver sooner. We are getting so excited to meet Baby D. It is finally starting to hit Matt and I that we will soon get to hold our new sweet baby. Size of baby: According to my ultrasound, he is measuring a whopping 7 lbs 1 oz! Movement: All of a sudden I can feeling him stretching. My stomach is not as round as it used to be! I am definitely lopsided on the left side where he is laying most of the time. Sleep: I have to take my medication for preterm labor at 2 am and 6 am, but other than that, I sleep great. Cravings: Anything cold to drink. Best moment this week: Seeing baby D via ultrasound and developing a plan with my doctor for his arrival! Thank you to everyone for all you love and support. I am back in the hospital. On Wednesday, I was at the hospital for my non-stress test. I started to have contractions every 10 minutes and a small bleed, and was admitted to labor and delivery. The doctor started an infusion of magnesium sulfate in hopes to stop the contractions. It worked for about 24 hours and then I started to contract through the infusion. My doctor than put me back on my previous medications, Procardia and Terbutaline, but at higher doses and increased frequency. Friday night and yesterday morning I had some issues with contractions, but otherwise I have been holding strong. I really want to try to make it to 36 weeks, but know that anytime now the baby will be safe to deliver. At least my room has a good view. The statue in the middle of the window is a cross. Tomorrow, I will find out if I will go home or stay in the hospital until I deliver. The doctor and myself are worried about the potential to bleed with my continued contractions and placenta previa. I have no idea what his plan is going to be. Matt and I are willing to do anything for the safety of the baby. Even through all of the contractions and medications, the baby is doing great and in no distress. He is moving and kicking like crazy. Matt and the boys just visited and brought me a Starbucks. It was so nice to see all my boys. The boys absolutely love Kindergarden. On Friday they walked a mile to school in honor of all the heros from 9/11. They walked with their 6th grade buddy and it seemed to be the highlight of the past few weeks. Well...not too much longer before the baby is here. The doctor said any day now!! We are all so excited to meet our sweet baby, but can definitely wait another week and a half! 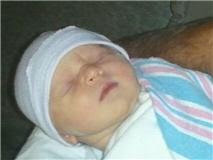 And the best news... My baby sister had her baby, Piper Elizabeth, on Friday! She and the baby are doing great. Piper is absolutely beautiful! I am so proud of Chrissie and over joyed for her and her husband Keith. I can't believe I am 34 weeks! Early on, my doctor said if I made it to 34 weeks we would have a party! I am not sure if eating hospital ice cream counts as a party, but it works for me! Size of baby: He measured 4 lbs. 11 oz. two weeks ago. Movement: He slept for a majority of my magnesium infusion. It was really strange only feeling little movements for a day. As soon as the infusion was done he woke-up and has been moving like crazy! I think he is making up for lost time. He also kicks a lot when I eat ice chips. I am not sure he likes me eating ice! Sleep: I sleep okay in the hospital. Just in 1 hour increments. Thank goodness I used to work midnights and do not have a problem going back to sleep! What I miss: The boys and Matt. Even though I know the hospital is the best place for me, I still miss being at home with all my boys. Best moment this week: Making it to my next big goal of 34 weeks. Any time now!! A perfect ending to a beautiful weekend! Thanks, Matt for completely spoiling me. Size of baby: He measured 4 lbs. 11 oz. last Friday. Movement: I have to go for a non-stress test twice a week where they measure the babies movements, heart rate and my contractions. The nurse said he is doing excellent moves like crazy during the test! Sleep: I am still having CRAZY dreams all night long! I am having occasional contractions that wake me up, but nothing terrible. 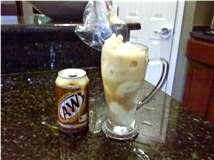 Cravings: Sonic root beer floats. What I miss: Nothing much. I love when the boys come running up the stairs to tell me about their day! Best moment this week: Hearing how excited the boys are about Baby D arriving!! What I am looking forward to: We always go to Sonic on Sunday's for an ice-cream treat! I put my seat all the way back and lay down. It is my big outing!! 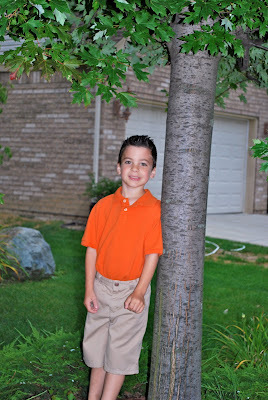 I cannot believe my boys are starting Kindergarten. Where has the time gone??? Thank goodness they are only going for 3 hours a day. I know that may sound strange to some people, but I am just not ready to have them out of the house for a full day. When the new baby comes I will be off work for a few months so I am really looking forward to spending some quality time with the boys. This will be my last year to do some special trips and projects with them during the day. The boys absolutely loved their first day of school!! I asked them what their favorite part of school was and Joseph said, "Being the leader boy" and Dominic said, "Coming home to you mom". Okay my heart just melted.